Here are a list of removal companies based in Warwickshire. They are listed in order of the number of reviews and likes. 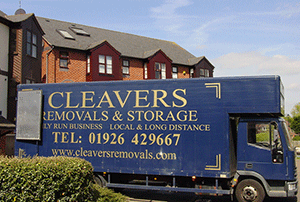 Cleavers Removals and Storage have been successfully moving their customers around the midlands since 1979. They are members of the national guild of removers and stores as well as the removals industry ombudsman scheme. They perform removals 7 days a week and move single items as well as larger home/commercial removals. Here is a photo of one of their removal vans. Henry & Son Ltd. is an established, professional, nationwide removal and storage company. With over 20 years of experience within the industry we offer a one-stop solution for quality removals and storage at an affordable price. Our impressive portfolio extends to many reputable housing developers, businesses and domestic customers. For 25 years we have been providing a wide range of removal services in the Coventry & Warwickshire area and can offer excellent moving solutions to accommodate household & business moves alike. We at Traslo care about our customers, one of our specialist movers will be at your service from the moment you ask a quote until the move is completed. We provide removals all over Europe and can provide a full door to door service or a part-load service depending on your needs and your budget. Our head office based in Nuneaton (Coventry) where we manage every move and coordinate our staff.